Wall Tag is one of the leading Geotextile manufacturer in Singapore. Being the leading Geotextile Manufacturer in Singapore, we have a strong sales and service network availability to cater our clients. Geotag non-woven geotextiles is used in revetment to prevent erosion and to retain backfill materials. The Geotag non-woven geotextile is an arrangement of fibres like polypropylene or polyester either oriented or randomly patterned in a sheet, resemble felt and with the help of the needle punching technology, it then creates a strong pliable textile with excellent elongation properties. The needle punching helps to protect geotextile from delaminating when exposed to wear and tear. Geotag non-woven geotextiles is design only permeable to water and air to pass through it or in it without obstructions. They are able to withstand both wet and dry conditions and they do not rot or attacked by fungus. Geotag Geotextiles are resistant to soil acid, alkalis and most chemicals. 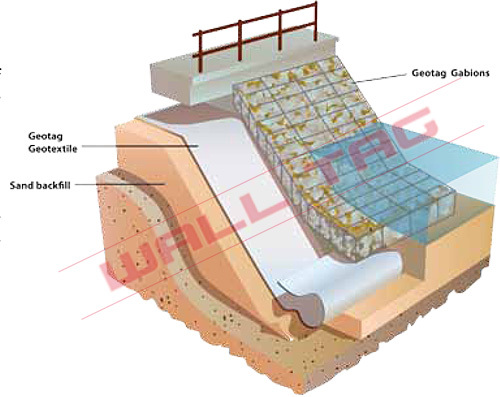 Geotag Geotextile comprises variety of thicknesses, weight and forms and each has its own special function. Geotag Woven Geotextile is used in many civil engineering and building applications. Geotag Woven Geotextile is manufactured by special weaving processes from polypropylene or polyester strip fibre and it has high strength in both directions while having very low elongation. Since the fabric is created with high strength, it has also an excellent weight ratio that resists UV rays, soil chemicals, mildew and insects. Geotag Woven Geotextile is an excellent separator and it ease on installation for road, building projects and embankment construction. This product is ideal for road building because it increases the life of paved and unpaved areas. Geotag Woven Geotextile are primarily used for separation, reinforcement and filtration. Geotag Composite Geotextile is made of high strength polyester woven fabric and non-woven polyester or polypropylene geotextile. Geotag Composite Geotextile is a combination of advantages of high-strength reinforced woven geotextile with filtration, drainage and protective properties of non-woven geotextiles. Geotag Composite Geotextile is suitable for reinforcement of fine-grain soil and it also works as a separator and filter for water and materials, e.g. soil, sand and gravels. It has a high tensile strength at a low elongation and has a high level of microbiological resistance. Geotag Composite Geotextile is easy to install, protects fragile materials against damage and therefore it creates low values of creep to ensure long-term stability. It also increases the safety and stability of embankments. It helps to reduce volume of earthworks which cuts the down construction cost and time.